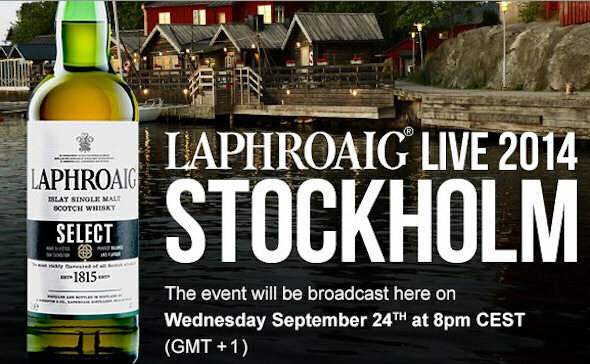 Laphroaig Live 2014 comes to Stockholm on the 24th September, 2014. This year’s show will be streamed live from a tiny island called Fjäderholmarna which is part of the archipelago just outside Stockholm. Watch the webcast unfold Live on Planet Whiskies. Below are the times when the webcast will start worldwide. The last few Laphroaig Live have been excellent and its a must watch if your into your whisky tasting. Please also post any questions you like too Laphroaig Live 2014 below before the event starts of the 24th September. A unique 12 year old triple casked Nordic special, this year’s much acclaimed Cairdeas finished in Amontillado casks, the latest Global expression called Select and a fourth that will be decided by a Friends of Laphroaig online vote. These will be paired with a smörgåsbord of Elk, Reindeer and Baltic salmon – all smoked over Laphroaig infused wood. The smoky flavour is sure to blend beautifully. An expert panel of guests will explore the strong connections between smoke and depth of flavour in what is sure to be a smoke fest! As always, we’ll be joined by Distillery Manager, John Campbell. This year he’ll be accompanied by a panel consisting of these famous Swedish personalities; Nour el Refai a comedian, TV personality, host and a well-known Swedish radio presenter, Peter Borg chairman of the Swedish Whisky Association and Håkan Dahlberg a prolific Swedish whisky blogger of I Love Whisky. ​ And last year’s Swedish Bartender of the Year Madeleine Solo Rapp will be making a guest appearance and creating something special using Laphroaig.